With five gene-therapy clinical trials underway or soon to begin, Applied Genetic Technologies Corporation (AGTC) is generating tremendous excitement for the potential to overcome vision loss from several inherited retinal diseases. 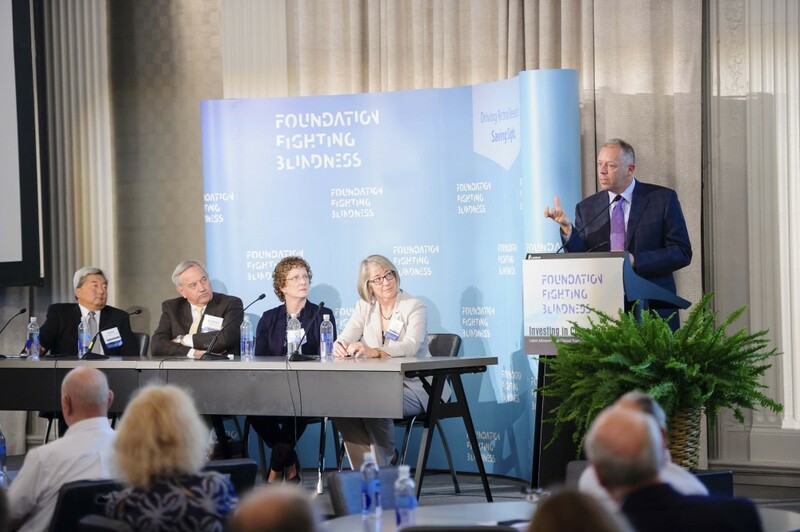 At the Foundation's Investing in Cures Summit on September 16 in Chicago, Sue Washer, AGTC's chief executive officer, emphasized FFB's crucial role in moving the company and its projects forward. "We as an organization would not be here today without FFB," she said. "And that all started with the work that was funded by the Foundation in Bill Hauswirth's lab at the University of Florida." Bill Hauswirth, PhD, is one of AGTC's scientific co-founders, and his groundbreaking gene-therapy research has been funded by FFB for 20 years. AGTC is now conducting early human studies for gene therapies for achromatopsia (day blindness) and X-linked retinoschisis (XLRS). The trials are progressing well with ongoing patient treatment and recruitment. In addition, the company has submitted an investigational new drug application (IND) to launch a gene-therapy clinical trial for people with X-linked retinitis pigmentosa. Next year, the company is planning to submit an IND for an optogenetic treatment — a therapy designed to restore vision in people who are completely blind from a wide range of IRDs. Ms. Washer explained that the Foundation also provided funding at a critical juncture in the company's growth and development. "When we were still privately backed, our funds were short. We needed key funding to push XLRS gene therapy forward," she said. "That $1.5 million funding came from FFB. Without that grant and our ability to move that product forward, the company would not have been able to attract venture capital, go public, and be in the position where we will soon have five ongoing clinical trials." In addition to funding promising biotech start-ups, FFB has played a critical role in developing research talent. Shannon Boye, PhD, an up-and-coming gene-therapy developer at the University of Florida who was mentored by Dr. Hauswirth, told the summit audience how important Foundation funding was in getting her career off the ground. "I received my first individual investigator award from FFB in 2012. I was so excited, I did the happy dance with my kids in my kitchen," she said. "The data I obtained from the FFB grant enabled me to get a five-year award from the National Eye Institute in 2014. I got the NEI grant on my first shot, which was awesome, and I very much have the FFB to thank for that outcome." Dr. Boye is currently partnering with the biotech Sanofi Genzyme to advance a gene therapy for Leber congenital amaurosis (GUCY2D mutations) into a clinical trial. She is also developing a dual-vector gene therapy for Usher syndrome type 1B, which is caused by mutations in the gene MYO7A. Most current vectors don't have the capacity to deliver large genes like MYO7A. Other presenters at the Investing in Cures Summit included: John Ash, PhD, an FFB-funded researcher at the University of Florida, reviewed lab research for his emerging neuroprotective treatments — including a drug and a gene therapy — which are designed to slow vision loss for a broad range of IRDs. Dr. Ash is also working to repurpose FDA-approved therapies as vision-saving treatments for IRDs. Daniel Chung, DO, the ophthalmic lead for clinical development at Spark Therapeutics, discussed how Spark's vision-restoring RPE65 gene therapy for Leber congenital amaurosis and retinitis pigmentosa (RP) is poised to become the first FDA-approved gene therapy for the eye or an inherited condition. The Foundation provided $10 million in research funding that helped make Spark's clinical trial possible. Halden Conner, co-founder and president of the start-up Nacuity, presented his company's emerging drug called N-Acetylcysteine Amide (NACA), an antioxidant that shows promise for slowing vision loss for people with RP and other IRDs. In addition to funding NACA-related lab studies at Johns Hopkins University, the Foundation is investing up to $7.5 million in Nacuity to move the drug into a Phase II clinical trial in 2018. Peter Francis, MD, PhD, a consultant to 4D Molecular Therapeutics (4DMT), presented his company's mission of providing custom gene-therapy vectors, derived from adeno-associated viruses (AAVs), for a variety of companies and researchers developing gene therapies for IRDs and other conditions. A key advantage of 4DMT's vectors is they are administered intravitreally — that is, into the soft gel in the middle of the eye — which is less invasive than subretinal administration (underneath the retina). FFB and 4DMT formed a partnership to identify and co-fund promising gene-therapy development projects. David Gamm, MD, PhD, an FFB-funded researcher at the University of Wisconsin, Madison, reviewed his emerging retinal patch, derived from induced pluripotent stem cells (iPSC), for restoring vision lost from a range of IRDs. The patch is composed of photoreceptors, which make vision possible, and retinal pigment epithelial cells, which provide essential support for photoreceptors. The start-up company Opsis Therapeutics has been formed to advance the treatment into a clinical trial and out to the marketplace. Eric Pierce, MD, PhD, is director of the Ocular Genomics Institute and the FFB Berman-Gund Laboratory for the Study of Retinal Degenerations at the Massachusetts Eye and Ear Infirmary. He reviewed his state-of-the-art genetic testing lab, which can identify disease-causing gene mutations in up to 65 percent of patients with IRDs. In addition, he is working to understand the molecular bases of several IRDs and developing gene and genetic therapies. Dr. Pierce is the lead investigator for ReNeuron's clinical trial for a stem-cell-derived therapy for people with RP. He was chairman of the Foundation's Scientific Advisory Board for 10 years and is currently its vice chair.